Airbnb has something to say to our fair city: Hello. The San Francisco-based company has skyrocketed to the top of the community marketplace dog pile, giving folks the world over access to cheapish lodging in over 33,000 cities. The gist is thus: anyone can log on and list their house—ranging from a room in a shared apartment to entire castles, depending on the city—for rent. It’s kind of like buying concert tickets off of a StubHub-esque site: say you’re looking to travel to London, but you don’t want to pay the sticker price for a hotel. Travelers can log onto Airbnb and peruse photos of available lodging in a variety of neighborhoods, but a bit of sifting is required to find the deals (an entire home in Covent Garden is listed at $182 per night, while a private room in a flat is listed at a high $132). The different listings were co-designed by celebrities (James Franco, Moby, Lake Bell, Anjelica Huston, Molly Sims) and HGTV’s Emily Henderson, and each space comes with its own slew of accompanying events (most of which are open to the public). Moby’s pop-up, for example, is located at The Viper Room, which will host a Silent Frisco dance party on Saturday the 28. Franco’s Hollywood Forever pop-up will host a night of art and music on Monday, September 30. Coveted booking rights for each pop-up were granted to a few Angelenos who entered an online contest, the rules of which included writing a love letter to L.A. in 140 characters or less. (You can see a list of Airbnb’s favorite submissions below.) “When it comes down to it, we really wanted this to be a celebration of L.A.,” Joffrion said. 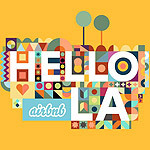 To see all of this weekend’s pop-up locations and RSVP for events, visit Airbnb’s Facebook page. 1. Succulants & Sycophants, Palms & Palm Readers, Trails & Trailblazers, Dreams & Dreams Realized. 2. Hipsters dine Rodeo. Posh hike Malibu. Surfers skate Hollywood. Coexist. 6. You’ll never ever be bored…unless you’re boring. 7. Japanese girl can marry German boy and live happily ever-after! 9. Open roofs, open skies, open bars, open minds, endless possibilities. 13. LA – A kaleidoscope dream; eclectic yet serene. 14. Proudly serving you the best looking waiters in the country. Sallie Patrick – Hollywood dreams, both realized and broken, haunt and inspire me.